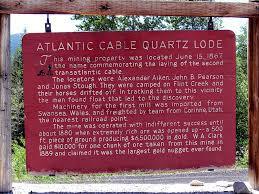 This mining property was located June 15, 1867, the name commemorating the laying of the second transatlantic cable. The locators were Alexander Aiken, John B. Pearson, and Jonas Stough. They were camped on Flint Creek and their horses drifted off. In tracking them to this vicinity the men found float that led to the discovery. Machinery for the first mill was imported from Swansea, Wales, and freighted by a team from Corinne, Utah, the nearest railroad point. The mine was operated with indifferent success until about 1880 when extremely rich ore was opened up, a 500 ft. piece of ground producing $6,500,000 in gold. 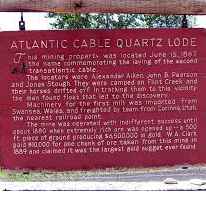 W. A. Clark paid $10,000 for one chunk of ore taken from this mine in 1889 and claimed it was the largest gold nugget ever found.